Happy (belated) November! Things have been moving really fast since our last blog post and we have a lot to share with you. It's all fun, but let's start with the most fun stuff for you guys—the rewards! We're getting ready to mail out the "Registered" stickers to those of you who donated $5-25 and to our pals who pledged $60 for a lifetime of free bike registrations. We should have those in the mailbox in the next few days. We also received the shipment of our totally rad pedal straps from Holdfast, and we're so happy with them. We think all of you pedal strap-receivers will be too. We've ordered the t-shirts, which will be printed by the wonderful team at Replica Chicago. They've been extremely attentive and super quick with their responses to our many emails asking about brands, sizes, and colors. The shirts we ordered are a little different than the ones pictured on our Kickstarter page, but don't worry, they are still super cool. Once the shirts are ready, we'll post some photos of us modeling them just so you can get the full effect before we ship them out ASAP! Our Twitter and Facebook followers probably already know this, but for those that don't keep up with us on social media (and if you don't, make our day! Follow us! ): We took a quick trip to Madison, Wisconsin this week! We drove up on Tuesday, spent two days riding bikes, visiting bike shops, and eating great food, and came back to Chicago Wednesday night. Seth getting the bikes ready to ride around in Madison. We looked at our Madison trip as a smaller, preliminary visit to get ready for our BIG West Coast expansion road trip. (More on that in a minute.) 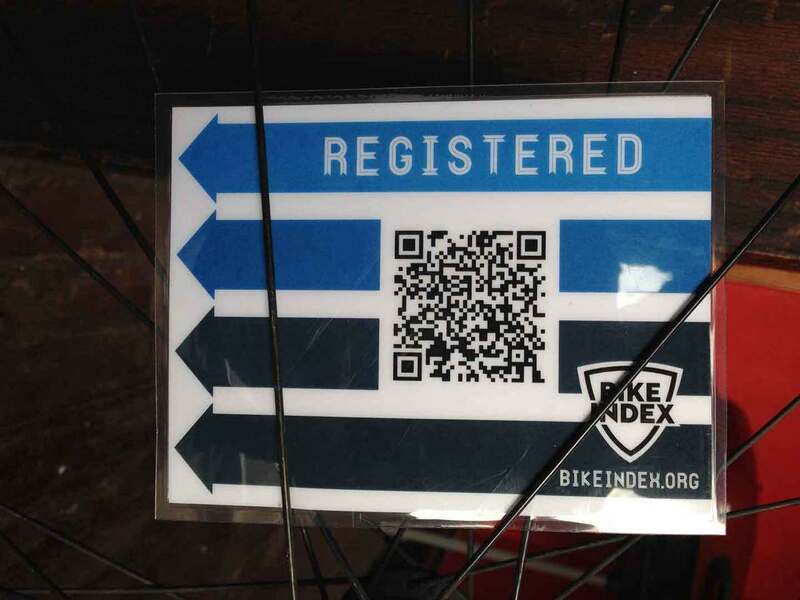 We wanted to see what it would be like for us to talk to shops in another town unfamiliar with the Bike Index and get them as excited about our registry as we are. And it worked! We're happy to announce the Bike Index is now in three Madison shops: Revolution Cycles, Machinery Row Bicycles, and Cronometro. We really love and admire Madison's bicycling community and bike-friendly infrastructure, so it means a lot to us to be in shops there. 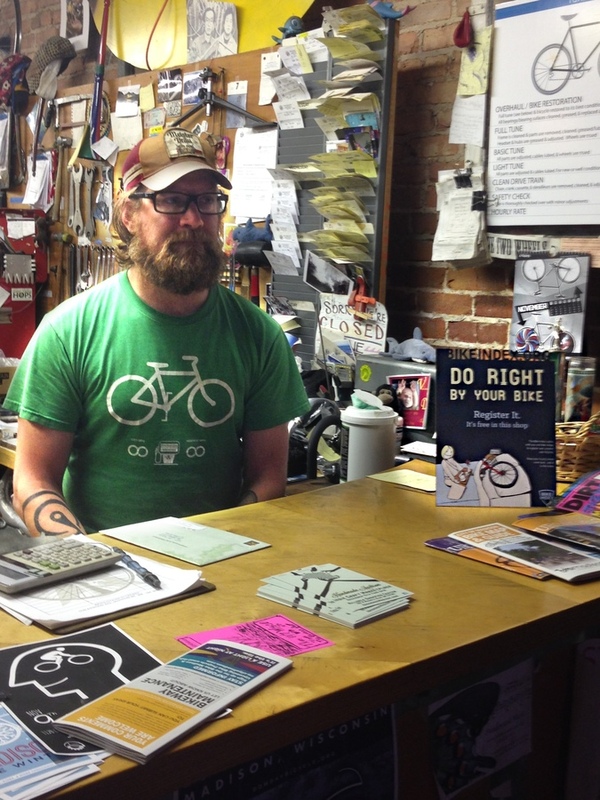 Jeff, owner of Revolution Cycles in Madison. We want to thank all of the staff at those three shops -- Jeff from Revolution, Lucas from Machinery Row, and Scott from Cronometro -- for sharing their time and enthusiasm with us. We also want to thank our friend Mike for letting us crash at his place and taking us to the super great German restaurant Essen Haus. 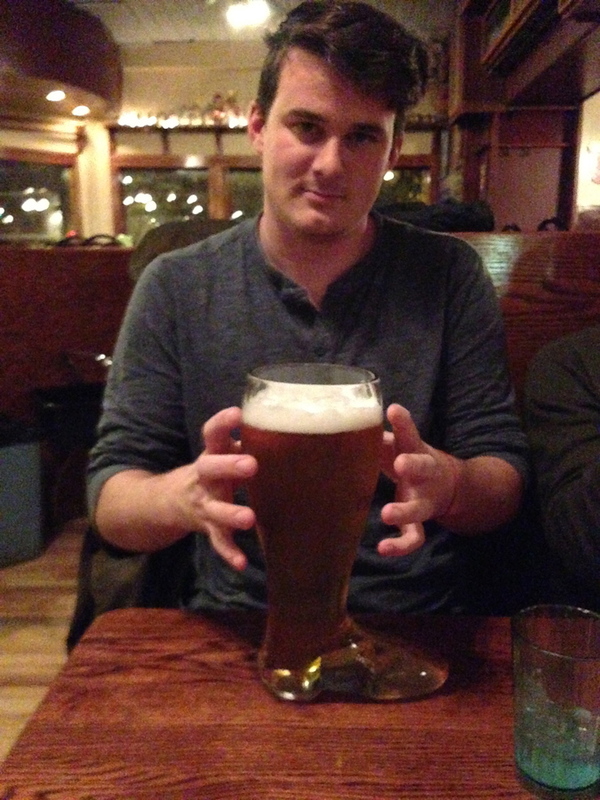 In a perfect world, every restaurant would feature enthusiastic accordion players and beer that you can drink out of a giant boot. Our friend Mike and a boot of beer. One of the biggest goals of our Kickstarter campaign was to raise money to dramatically expand the Bike Index by bringing it to other U.S. cities. We love Chicago and we love being Chicago-based. It's a fantastic city for startups, and we've received some great attention and love from Chicago shops and press. But in order to succeed as a national registry, we need to establish ourselves in the other big bike cities across the country. Your support is making that possible. In the next few days the Bike Index team will leave for a pretty serious road trip to visit five West Coast cities in two weeks: Denver, CO; Los Angeles, CA; San Francisco, CA; Seattle, WA; and Portland, OR. There will surely be a lot of driving, a lot of late nights, a lot of car bagels and trail mix. But it will also be an extremely rewarding adventure, and we're excited to make new connections, explore new shops, and make new friends. We're doing this because we know our physical presence in these cities is important—not only to register more bikes, but to show manufacturers, local governments, and police departments that the Bike Index is something people all over the U.S. are excited about and believe in. So make sure you follow us on Twitter, and like us on Facebook, to see what we're up to—and if you live in any of the cities we'll be hitting in our West Coast trip, make sure you give us a shout so we can hang out!